A research team is now working to put a massive drill into the the Gulf of Mexico's seafloor, with the goal of peeling back 65 million years of history. Their goal: to secure a nearly mile-deep core sample from the Chicxulub crater that's commonly linked to the end of the dinosaur era. "There's a lot of questions about mass extinction events, including all the extinction or kill mechanisms out there," says one of the research team's leaders, Sean Gulick of the University of Texas, Austin. If Gulick and his colleagues are successful, their work could bring insights into a range of topics, from prehistoric biology and planetary geology to Earth's current era of climate change. 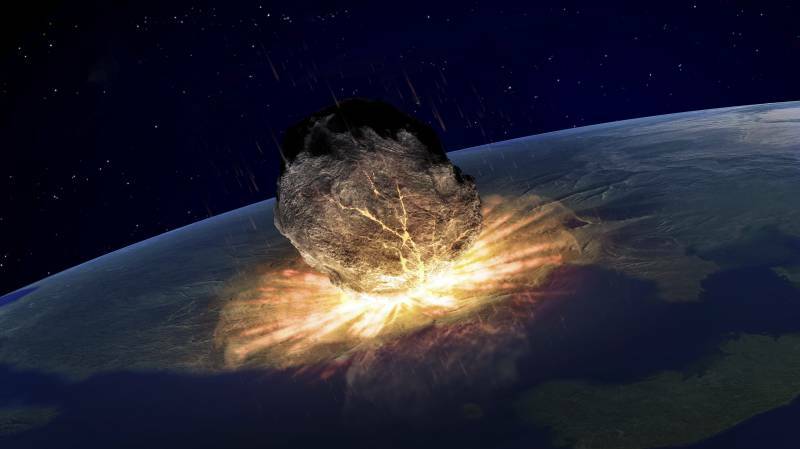 The impact of a miles-wide asteroid and the end of the Cretaceous period were catastrophic to life on Earth, erasing more than 70 percent of the planet's species, according to the most recent estimations. When it hit our planet, the impact must have looked something like an exclamation point, packing enough velocity and mass to make deep-seated rocks and other materials behave like water splashing in a pond after a stone is thrown into it. Using core samples, the scientists will explore Chicxulub's well-preserved peak ring — the rough circle of hills that's commonly seen rising above flat impact craters on Earth and other planets. "In that section," Gulick says, "the big excitement is, 'How did life come back at ground zero?' Was it the specialists that came back first, the generalists? Is there any clue to what organisms repopulated first, as opposed to what the environmental consequences were for the ocean?" To drill into the seafloor, a 137-foot craft called the Liftboat Myrtle is now using its tripod of 6-foot-wide legs to position itself over an offshore site that's about 25 kilometers from Progreso, Mexico. Workers on the Myrtle are preparing to "spud in" — start drilling — in earnest, with the first usable samples arriving next week. 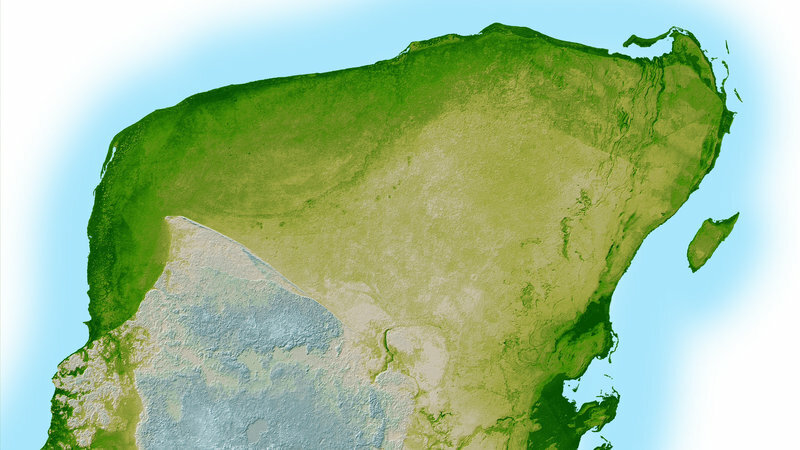 The Chicxulub crater from the impact that's widely believed to have caused the Cretaceous-Tertiary Extinction 65.5 million years ago is visible here in a shaded relief image of Mexico's Yucatan Peninsula. The project will run for around six weeks, involving an international team of researchers led by the University of Texas and Imperial College London. The team is backed by the European Consortium for Ocean Research Drilling, part of the International Ocean Discovery Program. The plan is to drill down 1,500 meters, or nearly 5,000 feet, through the seafloor. To be more efficient — an important aspect of a research project costing around $10 million — the team won't collect a core for the first 500 meters. Opening a window that spans more than 10 million years of tumultuous changes on Earth, the project will begin by focusing on a more recent geologic period that shares some similarities with current conditions on Earth: the Paleocene-Eocene Thermal Maximum, the last time the planet had a sharp elevation in CO2 levels. Part of what they hope to figure out, Gulick says, is why the Paleocene-Eocene Thermal Maximum didn't trigger much of a mass extinction event. "Most things just didn't worry about the high CO2 time, and kind of made it through," he says. "However, if you look today, at our current increasing CO2 values, already it's looking like we have a pretty big extinction event in the making. Is that something to do with vulnerability? Is that something to do with the specific kill mechanisms? We should understand this better, given that we're kind of in the middle of an experiment, ourselves." The samples will be analyzed for the potential presence of "extremophiles" — exotic organisms that might have thrived in the heat and chemical fluids. "To find those, we look for their DNA," Gulick says. "So we want to grab these samples as quickly as they come to the surface and freeze them at minus-80 degrees Celsius" to preserve them. At the time of the meteor strike, the area was covered by water. Today, about half of the resulting crater is on the northwest corner of the Yucatan, in an area about 100 miles west of Cancun. Millions of years after it was formed, the crater is still easily visible in a topographic image that NASA created back in 2000. Its diameter has been estimated at more than 110 miles. "This thing would have effectively punched a hole through the atmosphere," Gulick says of the asteroid that smacked into Earth. "It would've blown so much material vertically up into the vapor plume that some of it reaches escape velocity and completely encircles the Earth and rains back down again. Some it probably stays in the atmosphere. So there's quite a range of effects." "It went everywhere on the entire planet," Gulick adds, saying that today, "If you find the end of Cretaceous rocks, beginning of the Paleogene rocks, anywhere on the planet, you will find parts of the meteor and parts of the basement rocks from the Yucatan in that layer." Those basement rocks — granite and other materials — are also believed to be what helps form the peak ring. The impact would have brought them up to the surface from a depth of as much as 10 or 15 kilometers, Gulick says. Another element of the Chicxulub strike, he adds, is that the impact hit "a really bad place," in terms of the debris it generated. "It hit a spot where it was full of limestone and evaporites, including things that were rich in sulfur," Gulick says. "That was a particularly bad spot to have hit in terms of chemical effects. You know, putting a bunch of sulfate aerosols into the upper atmosphere is an incredibly effective way to block sunlight — in addition to the dust. And putting sulfate aerosols in the lower atmosphere makes acid rain. So, if we'd hit a different place, it might not have been as bad. It's really hard to say." When the team drills into the peak ring, they expect to find everything from airfall materials to deposits from a tsunami triggered by the impact. They'll explore what makes up the peak ring, which earlier seismic studies have shown to be fairly low-density. By looking beneath Earth's surface for signs of how a cataclysmic event reshaped life on our planet, the researchers are also hoping to learn more about how other planets have been shaped by projectile impacts. "In addition to being interesting from an extinction element," Gulick says, "it's also interesting because it's a well-preserved, very large crater that we can access without leaving the planet. It's equivalent to studying the really big craters with peak rings, for instance, on the moon, on Mercury, on Mars — but obviously at a fraction of the cost." To some people — particularly fans of speculative fiction — the idea of drilling into a crater that brought about the end of days for 70 percent of the Earth's species might sound like a risky proposition, one that raises specters of deadly alien material. I asked Gulick what he says to those folks. "I guess I immediately wonder what in the world they think we would find that is of concern," he says. "Time is on our side here. This is 65-and-a-half million years ago. That's a long time. You know, it's not still hot, for instance."